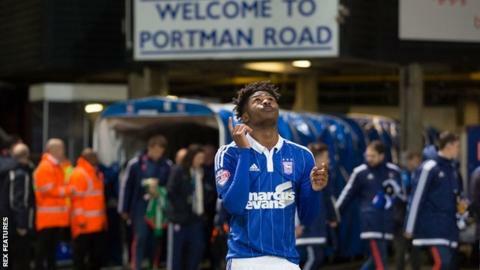 Ipswich manager Mick McCarthy was "extremely unhappy" with fans' criticism of winger Ainsley Maitland-Niles in the 2-1 win over Reading. The 18-year-old, on loan from Arsenal, was taken off at half-time on Tuesday. "At times he's been different class, other times he's been mediocre or ordinary, but overall I think he's been seven out of 10," said McCarthy. "He had a tough time the other night. I was extremely unhappy by the crowd towards him as it's not going to help." He added to BBC Radio Suffolk: "We've taken a young player on loan from Arsenal and he's come here to help us and in the main he has. I love him, he's a great kid." England Under-19 international Maitland-Niles has appeared 26 times for Town since joining on a season-long loan from the Gunners. And McCarthy said fans of his team, currently sixth in the Championship, need to get behind them, rather than get onto their backs. "I just thought the atmosphere was difficult (against Reading), we'd dropped out the top six, we've lost in the cup, it wasn't a great game and we weren't playing brilliantly at all," said McCarthy. "I fully understand that but it's not always about playing brilliantly, it's about winning and if we all stick together we've got a better chance. "But he's a kid, he wasn't getting any abuse, it was just all the moans and groans, he was having a tough time and as we saw it doesn't help. If someone is standing over you moaning and groaning it's not easy."